Week 16. This was the last of the heavy-lifting weeks of this training cycle. I ran 63 miles, some of them fast. I’m not sure why this image came up when I searched for “16,” but it spoke to me. 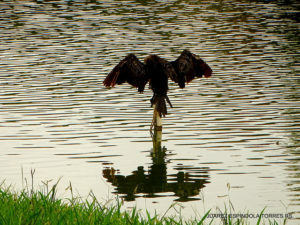 I’m not sure whether this bird is about to take off or just settling in upon landing. I kind of like both versions, and I’m kind of in both places: settling in for a landing after 16 weeks of increasingly intensive training, and about to take off for flight. Not right away–I’ve got some time still–but soon: 19 days. The week started with 8 recovery miles after 18 on the Sunday before. I felt okay. Then a return to the 400. I hadn’t done 400s since that day at the beach, the “Death By 400 Workout.” I thought that this time would be easier. I was right, not only because I wasn’t running in the 80 degree mornings of July this time (I still had a full dose of humidity, but it was much cooler), but also because since then, I’ve completed a solid block of training. I did the two mile warm-up and went to my usual 400s spot. I thought about my BirdCamp friends Uli, Allison, Stephanie, Cecelia, and Jaqueline (we did a few 400s together as part of the interval workout), and I imagined running with them the way that we ran in Boone a few weeks ago. The workout was really good. It was just hard enough to be a challenge, but I had no trouble completing the circuit. On Wednesday, I enjoyed my day off–I’m really enjoying my days off right now! Thursday threw me for a bit of a loop, but that’s because when I looked at Thursday’s plan earlier in the week, I somehow looked at the wrong Thursday. Instead of 12 miles with 8 at marathon pace, which I have on the docket for THIS Thursday, I had 6 mile repeats at marathon pace minus 10 seconds. And that was fine. It was just a surprise on Thursday morning because I had been anticipating something else. Friday was another 8 in the morning, a quick shower, and then I drove to Myrtle Beach for the weekend, where I would be running the Myrtle Beach Mini on Sunday. Saturday’s 8 were on the beach. As I commented on Strava, beach miles are hard miles. It was lovely. I got up early so that I could watch the sunrise, and it didn’t disappoint. But the sand was very soft; even at the tide line, it was very soft. I saw a number of monarch butterflies washed up on the beach–never more than one or two at a time, but I probably saw 7 or 8 in total. They were beautiful and sad. I also found a couple of conch shells, mostly in tact. So when I found the first one around mile 2, I picked it up and carried it with me. It fit in my hand surprisingly well, so it kinda looked like I was wearing a knuckle guard of some kind. I found another one around mile 5, and it was also really cool, and it fit surprisingly well in my other hand (and these wouldn’t have fit the opposite hands–I tried), so I carried it too. For 3 miles, I ran on the beach with conch shells, one in each hand. They got a little bit awkward at the very end, but I brought them back to my room, rinsed them out and ended up bringing them home with me. They’re pretty great. Even if I’m the only one who thinks so. I went to the outlets later on and then spent the rest of the afternoon and evening taking it easy. I walked on the beach during the dusk time, which was beautiful and melancholy. And then I went to bed early, because I had a 4AM wake-up for the race the next day. It was still stupidly humid–like 93% at the start and a bit warmer than would have been ideal (63 degrees, which would have been okay if it were more dry . . .) My warm up was uneventful; I jogged around the parking lot. I felt a bit self-conscious in my crop top (my Oiselle team sports bra) and spandex since I didn’t see anyone else was wearing racing kits (and I wasn’t racing this half; it was a training run), but with the humidity, it was going to be too warm for anything else. My plan was to run the first 3 easy, to practice letting the crowd around me pass me by, to stay calm and steady and concentrate on my breathing amidst the chaos. Nice and smooth. I saw one of my Volée friends at the start (I didn’t know she would be there). She was running with her partner, so we said a quick hi before the start, and then the race began. I had lined up just behind the 9 minute pacer. I figured that my easy pace would probably be a little slower than that, and then I’d go on ahead once it was time for the marathon pace miles. I was surprised to fall a good bit behind the pacer almost immediately, but I keep my effort easy and was surprised to see that I was a little under 9 minute pace myself. So I let the pace group go. Soon enough, it was time to pick up the pace. Even when I went from a 9 minute pace to 8:23, it took me a couple of miles to get around that pace group (which means that they were still going too fast). The course was mostly flat, and the sunrise, was lovely. The aid stations were spaced out well, and the volunteers were great–special shout out to the kids around mile 7 who had the “WATER!” “GATORADE!” rally cry going on! There was a lovely section of beachfront with a totally lovely view. And then we hit the hotel strand, which meant that we were going close to the finish. I was running mostly by myself for the last few miles–I mean, I was running by myself the whole time, but there were more people around earlier. By mile 10, there were fewer people near me, and for a while around mile 11, I was alone. So there’s potential for a great race photo, since there was nobody else around. But then, I’m in my kit, which might look okay, and might not by mile 11. Who knows. Guess we’ll find out. Or at least I’ll find out. The last mile of the race is a bit nasty. It’s still flat, but we run past the finish line for about a half mile before looping back around. The final half mile is a winding bike path on the beach. I could have done with out the twists and turns, and I did my best to split the difference. I was still mostly alone by then. I had sped up a bit for the final three miles, and I still felt pretty good–good enough to talk to the photographer and various spectators who were cheering me on. I passed a couple of guys in the final stretch and just about caught the last one at the finish line. I would have taken him too had I another 10 or 12 feet. Update: according to the photos at the finish, I did catch him just before crossing the finish line! I finished in 1:49:36. I wasn’t trying to PR, and this wouldn’t have been the day for it with the humidity, but it was good enough for 5th in my age group. I ran my cool down, which was less fun since I was running a mile out and back into the course, and I saw some struggles. I also felt a bit like a heel running in the “wrong” direction, and then turning around and running back but not with the racers. I picked up my medal, which is huge and kinda heavy. I got a banana and a bagel half. I got my drop bag, and put on a long sleeve shirt since I was soaking wet and starting to get a chill. I decided to check out the beer garden, but in order to gain entry, I had to flash the female volunteer since by bib was pinned to my crop still. I’m glad that I went in though–Sam Adams! I only had one (we could have 2) since I had to drive home and I was pretty dehydrated. Plus, by the time I was finished with the one, the line was really long, and it was 10 AM. I was supposed to check out of the hotel by 11. I decided to walk back to the hotel on the beach, which was lovely. It was a beautiful, sunny day, and the surf was cool but not cold. I got back to the hotel, stood in the surf for a few minutes as a sort of not-so-icy ice bath, and then I went up to my room. I took a quick shower and checked out of the hotel. Suddenly, I was starving, so I stopped and got food before beginning the drive back. All in all, it was a good week. It was an intense week. And now the taper begins.